We’d love your help. Let us know what’s wrong with this preview of First Ladies of Running by Amby Burfoot. In 1961, when Julia Chase edged to the start of a Connecticut 5-miler, officials tried to push her off the road. At the 1966 Boston Marathon, Roberta Gibb hid behind a forsythia bush, worried that police might arrest her. The next year at Boston, Kathrine Switzer was assaulted mid-race by a furious race organizer. In the mid-60s, Indianapolis high schooler Cheryl Bridges was told not to run anywhere near the boys' track team because she might "distract" them. When Charlotte Lettis signed up for the University of Massachusetts cross-country team in the fall of 1971, she was told to use the men's locker room. A few years later in coastal Maine, young Joan Benoit would stop her workouts to pretend she was picking roadside flowers, embarrassed that her neighbors might spot her running. First Ladies of Running tells the inspiring stories of these and other fiercely independent runners who refused to give up despite the cultural and sports barriers they faced. Legends such as Doris Brown, Francie Larrieu, Mary Decker, Jackie Hansen, Miki Gorman, and Grete Waitz are chronicled by Runner's World editor Amby Burfoot. Burfoot even runs the 1994 Marine Corps Marathon with Oprah Winfrey, whose successful finish opened the floodgates for other women runners. First Ladies of Running is a beautiful and long-overdue tribute to the pioneers of women's running, and a gift of empowerment for female runners everywhere. To ask other readers questions about First Ladies of Running, please sign up. I felt quite misled as I read through these 22 runner profiles. I hoped to learn about the female movers and shakers in the world of running. Instead, I found huge gaps in Burfoot's work and was disappointed to see that my own sport of ultra-distance running was not mentioned at all. This is a history of women's running in the United States with the marathon distance as its pinnacle. Although I enjoyed learning of these American running pioneers, Burfoot fails to mention that international women I felt quite misled as I read through these 22 runner profiles. I hoped to learn about the female movers and shakers in the world of running. Instead, I found huge gaps in Burfoot's work and was disappointed to see that my own sport of ultra-distance running was not mentioned at all. This is a history of women's running in the United States with the marathon distance as its pinnacle. Although I enjoyed learning of these American running pioneers, Burfoot fails to mention that international women were already running and winning races at these distances while the USA kept its prohibition-like rules for keeping women off the track. It is very important to note that other countries did not have the same archaic rules banning women from participating in long distance running. Also, Burfoot makes it sound like the marathon is the maximum distance that has been attempted. There are real omissions in limiting his research to track and marathon. What about 100km and 100 mile races? Where is the data about those? I did a little research of my own and found that women had results in 100 km races (Switzerland) as early as 1962, while the US did not allow women to run longer than 800 m at that time. I finished this book in tears. I was unaware of all the hard work women had to do to get this sport to where it was today. To think, we used to be viewed as too delicate to run! I think it's hard for a man to give an accurate description of what it must have been like for female runners to compete during a time when women were not allowed on most courses. The individual stories are interesting, but there's a lot missing from this book. For example, there was no mention whatsoever of Stamatis Rovithi or Melpomene and very little mention of Violet Piercy and Arlene Piper. In terms of overall history in the sport, the book fell a bit flat. I preferred Loraine Moller's pers I think it's hard for a man to give an accurate description of what it must have been like for female runners to compete during a time when women were not allowed on most courses. The individual stories are interesting, but there's a lot missing from this book. For example, there was no mention whatsoever of Stamatis Rovithi or Melpomene and very little mention of Violet Piercy and Arlene Piper. In terms of overall history in the sport, the book fell a bit flat. I preferred Loraine Moller's perspective in her book, "On the Wings of Mercury." There were a few other minor issues I had with the book. Though Mary Slaney was rightfully included, there was no mention of her later drug use in the sport. Also, at the end of the book, there was a large grouping of runners listed as a nod to many who were pioneers during the 50s, 60s, 70s and 80s. Missing from this long list is Ann Trason, an ultra runner who broke 20 world records and set an example, possibly the most impressive one ever, of how women can not just run ultras but win them outright. Perhaps her career started too late, but there were a few others on the list who were hitting their stride in the late 80s as well. One last note is that, as someone who was cut off and blocked by men in several races in the 80s, I felt these incidences were downplayed in this book. In nearly every case, the author suggests these types of events didn't happen often and implies they weren't that big of a deal. It's possible the ladies themselves feel this way, but I disagree. It's worth a read, though. Just note that there's more to the story. 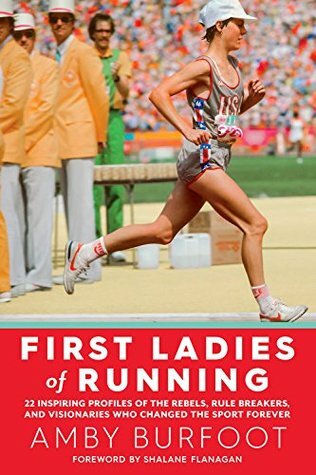 Great read on the first ladies of running! Inspiring to know a bit more of the pioneering women who made running in public nothing to be ashamed of and you were no less female for competing in races, and winning them! The women who win the races they start to the woman who helped us all realize if you can run a marathon you can do anything. In this important book, Amby shares the courageous stories of 22 female runners in the 1960's and 70's. I highly recommend this book for runners and non-runners, women and men! I loved it. It it is crazy that it was not that long ago women were not allowed to run long distances. I really enjoyed this because I love reading about running and reading about badass women. This is what it says in the subtitle--22 inspiring profiles of the rebels, rule breakers, and visionaries who changed the sport forever. Ms. Burfoot did a great job of balancing personal details with facts and numbers. It could have been longer and still held my interest, but it didn't need to be. And it was, indeed, inspiring. In the 1922 Olympics in Amsterdam, the IOC permitted a women's 800 meter race. It had dire consequences for the sport of running. Ms. Burfoot writes that one runner collap This is what it says in the subtitle--22 inspiring profiles of the rebels, rule breakers, and visionaries who changed the sport forever. Ms. Burfoot did a great job of balancing personal details with facts and numbers. It could have been longer and still held my interest, but it didn't need to be. And it was, indeed, inspiring. In the 1922 Olympics in Amsterdam, the IOC permitted a women's 800 meter race. It had dire consequences for the sport of running. Ms. Burfoot writes that one runner collapsed on the track--briefly--and a few others looked so tired and harried that the IOC banned the distance. As the author mentions, some of the men looked equally exhausted but no one even noticed. Nit-picking aside, the spirit of the book is excellent and the stories are both uplifting and painful. It's heartbreaking to read about the many times these runners were sidelined with injury. The science of the sport has advanced greatly since the 50s-70s, when these record-breakers were training, making and breaking. Many of their injuries might have been prevented with better training, more rest, and less oppressive footgear. But of course, not all of them. These are athletes and athletes sometimes get hurt. They're aggressive, determined, and uncompromising competitors. They pushed themselves beyond the limits and didn't give up easily--if at all. A very good book detailing the struggles of women in sports in the USA. It is strange to think that in my lifetime, women could not run cross-country, 800/5k/10k events, or marathons similarly to men. I applaud these women and their supporters for breaking barriers and forging the way to the more healthy environment we have today. Cheers to these pioneers and the tough struggles, and the visions they achieved to lead the next generations to a more equal playing field. It was very interesting to read the stories of these women who were at the forefront of long-distance running for women. I started running in 2006, and I'm sure I benefitted from the hard work and courage of those women who went before me. It's not a quick read simply because of the sheer number of runners profiled, and because the profiles are well-done, but it's certainly an easy read. Love, love, loved it. A must read for any female runner, or really any runner. This was so inspiring and eye-opening. It's hard to believe how recently gender barriers in running were broken down. This made me feel excited for my daughter's generation. Imagine how fast they will be, growing up with all the opportunities that they have. We owe so much to these ladies who paved the way. Loved, loved, loved this book! It was so great to read about my childhood running heroines and learn about many other women runners. This book made me realize that my running path was already well worn by these amazing women. I absolutely loved reading this. Every single female runner's story featured in this book is so inspiring, and now, more than ever, I can't wait until I can train for another marathon again. If you're a runner, I can't recommend this one enough. Read it! I am not sure what took me so long to finish this book except that I wanted to read every word about every person highlighted. But there were just too many. And so MANY valuable pioneers in women's running! Didn't need Oprah in the book.at.all. A great book about some of the pioneers of women runners. I love the in depth information about each women's upbringing and early running experience. The quotes by the runners are a perfect way to start each section. I throughly enjoyed this book. Humbling and inspiring. I recommend reading slowly and not as a book to fully appreciate each of the First Ladies (I read it too fast!). a pleasant overview of some of the women who played the most important roles in running history. not super deep -- just . . . pleasant. Loved this book. Incredible and inspiring stories, thoughtful and clear writing. I promise you do not have to be a runner (or a woman) to enjoy it. reading it straight through got slightly repetitive as lots of them had fairly similar experiences of overcoming sexist discouragement to take up running. but read and enjoyed one at a time, what a great set of mini-bios. Many of them are my contemporaries -- I was in the stands in LA in 1984 when Joan Benoit Samuelson won the first women's Olympic marathon gold medal and 30 years later lost a duel with her down Boylston Street to the finish of the Boston Marathon; I raced Marilyn Bevans in the M reading it straight through got slightly repetitive as lots of them had fairly similar experiences of overcoming sexist discouragement to take up running. .........all of which is to say that I SHOULD be more conscious of how drastically things have changed for women in running, and in sports in general. But like a rat staying in boiling water that is heated up gradually, I take progress for granted until reading these sorts of vignettes: in 1961 the first woman finished an American road race in Chicopee Mass., characterized in the next day's Boston Globe: "Julia Chase, an attractive 19-year old Smith College student is causing almost as much dither these days as Amelia Bloomer did when she introduced unconventional ladies garments in 1849" (p. 11). I liked the book a lot, I think women would get more inspiration than me from reading these stories, nonetheless I did find them interesting and worthy of way more recognition than they get, because at least in my country, even when I am involved in running communities and read about running and watch movies and documentaries about runners, I didn't knew anything about the great majority of the 22 women portrayed in this book. The photos are really neat. I have to confess that on several occasio I liked the book a lot, I think women would get more inspiration than me from reading these stories, nonetheless I did find them interesting and worthy of way more recognition than they get, because at least in my country, even when I am involved in running communities and read about running and watch movies and documentaries about runners, I didn't knew anything about the great majority of the 22 women portrayed in this book. The photos are really neat. As a woman that started running at the age of 10 in 1976, I had no idea the struggles of those who came before me. I was amazed by the stories of these strong ladies who did what was right despite what the men in the world thought. Joanie has always been my running hero. Her marathon victory was a huge inspiration and I was privileged to meet her a few years back Amby picked some great woman to profile. I guess my only complaint would be not including some more track athletes like Wilma Rudolph. Great short profiles by a writer and marathoner with decades of experience. At a minimum, this needs to be in every school library so kids can use it to write papers for Women's History Month. But it is good reading both for the individual runners and for the slow increments of history in women's running. It starts with women running as unofficial entrants and ends up with half of all entrants being women. Quite a story. I had no idea the struggle of former woman runners until I read this book. I had her about the Boston marathon and trying to be pushed off the course by the race director, but there were so many stories similar to this one. I think women today take for granted how far we have come and how just 25 years ago there was still inequality in running. Very enlightening, the type of book you can read a chapter put down for awhile and revisit later. Currently tapering for my second marathon, I am grateful to these women for making it possible for me to even toe the line at all, considering I was born before the Olympic Marathon for women. I enjoyed reading the profiles of these women and learning both about their struggles and their passion and dedication. Might have to revisit this book before each goal race!